This movie is the esoteric reflection of the songwriter Mahadev OK's first album "Katoomba". Mahadev came to Australia during summer 2016 to accompany a group of students. From Perth he will travel to Brisbane, Byron Bay, Sydney and will end up in Katoomba, in the Blue Mountains. This is where he will meet Willem and his friends, attending house party, performing, reading tarot and being amazed by australian landscapes. 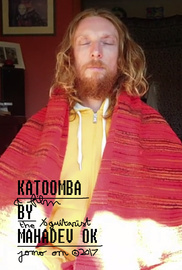 Although it could be just a road movie selfie video, Katoomba tells the story of he who had lost his astral body and does his best to reconnect whith this other part of himself. Katoomba is strange, funny and highly musical. Most of the best songs of the album Katoomba are worked out in the movie, sometime composed or performed live before studio. Katoomba intruces us to the new legenday yogi songwriter Mahadev OK.